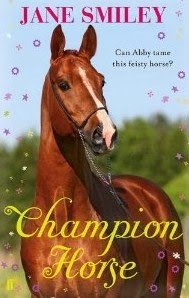 Champion Horse is the fourth in the Abby Lovitt series, set in 1960s America. Abby’s father buys horses, and sells them after Abby’s schooled them. Abby herself has changed her view of this over the series. It’s been difficult for her, falling for horses who are then sold, but she does now have her own horse. I’ve enjoyed the other books in the series; mainly for their unhurried pace and their careful portraits of the horses Abby rides. This book I found much more of a slow burn. Abby is a remote character, an observer rather than one who instigates anything, and for the first half of this book she’s observing to such an extent she rather lost me. I longed for the book to if not catch fire, at least to do something that would encourage me to enter Abby’s world because I cared about her and what she was doing. Fortunately, half way through, things pick up.